by Robert E. Crew, Jr.
Click here for 33 full quotes from Jeb Bush in the book Aggressive Conservatism in Florida, by Robert Crew. This book is an academic analysis of Jeb Bush's political philosophy and policy actions during his two gubernatorial terms. The emphasis is on "academic": the author is a professor of political science at Florida State University. Hence this book does not read like a typical political book at all -- it reads like a classroom study, with well-documented references and extensive footnotes. The history of the Florida legislature (8-year term limits passed in 1992, and hence took full effect in 2000, one year after during Jeb's first inauguration in 1999; that greatly empowered the Executive branch relative to the Legislative branch, pp. 64-5). A theory of privatization as a core principle of government (pp. 116-7 as a philosophy; p. 30 as a policy goal of reducing state worker headcounts). A variety of empirical measures permit an objective assessment of the political legacy left by a governor. These include the extent to which a political figure affects partisan attachments among citizens, and the degree to which he or she improves the electoral fortunes of his or her party.... An examination of these measures in Florida reinforces the view that Governor Bush left a modest political legacy in the state." We THINK that means, "Political scientists measure governors by how well their party does, and by how well others of their party do, too; Bush didn't do so well by either measurement." In other words, fewer Floridians registered as Republicans after Jeb than did before Jeb, and the Republican Party of Florida's elective position got weaker as well. 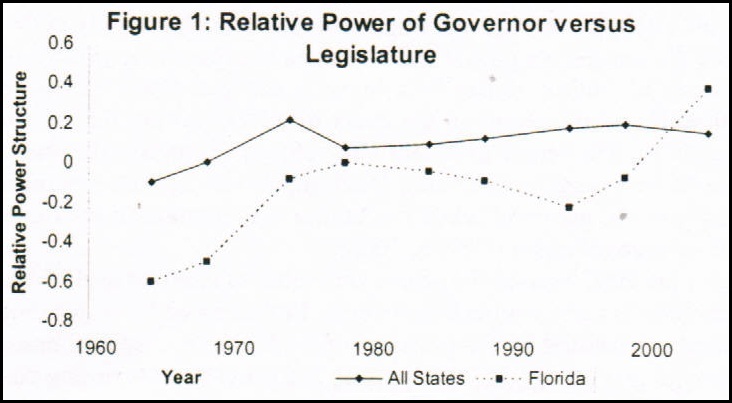 But the author substantiates that Jeb did accomplish his philosophical goals, using a massively academic chart: That chart (p. 68) indicates that when Jeb took office in 1999, the Florida governorship became a stronger office than the national average, whereas before Jeb the Florida legislature was the stronger branch. But if one reads the several paragraphs accompanying the chart, the author clarifies that the chart summarizes a multi-year survey of Florida executive branch officials. In other words, this chart indicates what state workers THINK about legislative power in Florida compared to other states -- not anything that Jeb actually did, measured in some objective manner, or even anything that Jeb said. Reading the rest of the book, astute readers might note that the big swing in power came about because of the implementation of legislative term limits, which was passed in 1992 (the turning point of the chart) and threw out many long-time legislators in 2000 (pp. 64-5). The author doesn't make that connection -- leaving it to the astuteness of the reader, or more likely leaving the reader to incorrectly assume that Jeb CAUSED the change. I guess that's what "political science" means: making charts that readers must really study to understand. For most readers, that's way too academic -- it'd be better to explain the political implications directly, rather than leaving so much to inference. We don't think the author is biased against Jeb -- just too biased towards academia. But the author assuredly does not LIKE Jeb Bush: referring to Jeb's nickname as "King Jeb," the author cites a Republican legislator saying, "In his heart of hearts, the governor prefers dictatorship to Democracy" (p. 171). It's fine to have an anti-Jeb bias -- we conclude that this book is a reasonably unbiased analysis of Jeb's governorship. But the reader should be prepared for an adventure in academia! Funded adoption counseling, but not abortion counseling. Prevent use of public funds for stem cell research. 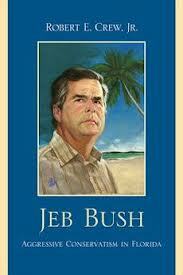 Florida budget grew by 27% during Bush's terms. Symbol of crime needs a human face on it. Passed Habitual Offender Accountability Act. Guarantee college admission for top 20% of high school grads. Catholic Conference sought more voucher accountability. 60% of FCAT-passed schools failed to meet NCLB standards. Florida Forever: $1B for environmental land purchases. Everglades are "crown jewel" of Florida environmental legacy. Acceler8: $1.5B plan for Everglades restoration. Declined results of state survey to limit urban sprawl. Legislative term limits strengthened Bush's executive power. OpEd: Foundation for Florida's Future hides campaign donors. Refused to fund state agency requests for specific services. Mature society can empty government buildings of workers. Judges should respect primacy of Legislature & Executive. Asked judicial candidates: Are you a God-fearing churchgoer? 2004: Purged felons list from eligible voters. 2005: Achieved goal of restraining growth in spending. Stand-your-ground bill: Deadly force OK when threatened. Move Medicaid from "defined benefit" to defined contribution. Provide risk-adjusted premiums (insurance vouchers). Slashed every request for adult mental health. OpEd: Medicaid reforms won't cover chronic conditions. Job growth during Bush terms, but very low wage jobs. Bush family name is a detriment that limits career choices. Privatization became administration's fundamental philosophy. Social service benefits via private & faith-based companies. Remove Intangibles Tax on stocks, bonds & dividends. Increased transportation budget by 96% over 8 years. Proposed refusing federal money for welfare. Created Governor's Faith-Based Advisory Board. by Robert E. Crew, Jr..